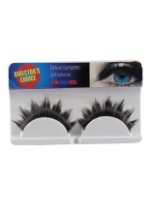 Take your Halloween party back to the 1920s in this teen flapper costume! This polyester teen flapper dress has the look and feel of crushed velvet and features many details, including black neckline trim, bow, and sewn on flapper bead necklace. There is loose thread trim that hangs on the chest and at the bottom of the dress. Above the dress hem there are black design prints that give the dress an elegant touch. The headpiece is a black sequin headband with black feather attached. There is also a plastic pink bead for detail. 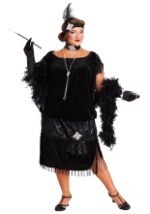 Jazz up this flapper girl costume with our sparkling 20s jewelry!